I met Jeff online in around 2001 or 2002 -- we had mutual friends, but didn't really chat all that much until 2003, when he came to Boston to meet up with me and a bunch of other people who all frequented the same online forum. I thought he was pretty cute, but he was very shy, and barely talked to me at all. I thought he didn't like me! We started emailing, and chatting on IM, and in February of 2003, he came back to Boston to visit me (I was sure it wasn't a date, he was sure it was). We spent the day wandering around Boston, talking and laughing and having a fantastic time. Before long, he was making the trip from Springfield to Boston every Friday night, and heading back home on Sunday evening. 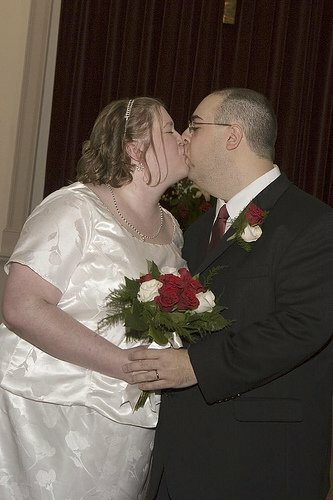 We got married on October 28th, 2006, and couldn't be happier. I never thought anyone would want to be with me because of my size, but he thinks I'm beautiful, and I think he's utterly hot!